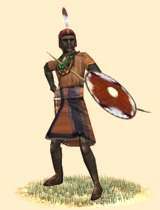 Skirmishers form the backbone of any Ethiopian army, especially bowmen. Skirmishers form the backbone of any Ethiopian army, especially bowmen. Hunting being an important part in Ethiopian life, at least in the interior plains and mountains means there is no shortage of able archers to call upon from the Ethiopian lands. In addition to their bow, every archer also carries a club for close combat should it happen, and they also carry shields. Depending on from which region these archers are raised, some might march to war in simple tunics while others prefer to fight without. As long as these archers are used in their intended battlefield role, that of archery, they will do their duty well and should they be caught in close combat their clubs and shields will help them a bit, but a wise general should not expect these men to hold out in any prolonged melee. Historically, ancient Ethiopia (encompassing modern day Eritrea and northern Ethiopia) was at this time made up of many smaller kingdoms that waged wars against each other, but also against any foreign invaders, like the Nubians, Hellenes and Sabaeans. There were basically three main regions in ancient Ethiopia; the coastal lowlands along the Erythrean Sea, the interior plains and the mountains separating them. The coastal lowlands seem to have been the most prosperous and were often raided by the mountain kingdoms. Most evidence indicates that the Ethiopians living along the Erythrean Sea were the most urbanized and also the most influenced by foreigners who established colonies and trade posts along the coast, like the Hellenes and Sabaeans and when it came to the latter, adopted their religious practices, which was a legacy of the earlier Sabaean rule in Ethiopia or D’mt as it was also called, although to which extent Ethiopia was ruled or if it was ruled at all by Sab’yn is a matter of debate. There are also evidences of Judaism being prevalent in ancient Ethiopia due to archaeological findings of temples and altar stones from 500 BC on, resembling ancient Jewish temples and sacrificial altars from 800-600 BC. Ethiopian warfare at this time seems to have been similar to that of their Nubian neighbours, but there were regional variations in arms and armor when it came to materials used. The dominant type was skirmishers armed with either javelins or bows, and sometimes on horseback. They would also be armed with clubs for close combat. Spearmen were also used and the coastal peoples also fielded small, but elite contingents of swordsmen, either influenced or equipped by foreigners, serving often as bodyguards for kings or chieftains.prolonged melee.